Sandy Lloyd started working for the Agriculture Protection Board in WA in 1986 after completing a Bachelor of Applied Science. Initially she worked on field and glasshouse trials of various weeds including skeleton weed, Paterson�s curse and gorteria. She also worked on various biocontrol projects, including rearing and releasing Dialectica scalariella, an agent for Paterson�s curse . The APB became part of the Department of Agriculture in 1995. Sandy now mainly provides technical services such as weed identification and surveillance, providing advice on weed biology and ecology, and takes part in response to new incursions. Sandy is a member of the Weeds Society of WA and was the first female and longest serving President. 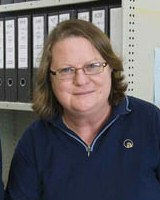 Sandy is also a long-serving delegate of CAWS and served as President in 2009-2010. Sandy was a participant in the Weeds CRC and is one author of the book Western Weeds � a guide to the weeds of Western Australia, and the report Front door wide open to weeds which led to a change in national policy. Hussey, BMJ, Keighery, G, Dodd, J, Lloyd, SG and Cousens, RD. (2007) Western Weeds � a guide to the weeds of Western Australia. Weeds Society of WA. Spafford Jacob, H., Randall, R.P. and Lloyd, S.G. (2004). Front door wide open to weeds. An examination of the weed species permitted for import without risk assessment. WWF Australia. (140 pp).